The first jolt that drowsy summer afternoon came a few minutes after 2. Startled citizens barely caught their breath when they were rocked again seconds later. The earthquake of Aug. 10, 1884, toppled chimneys in New Jersey and New York. Measuring a magnitude of 5.2 on the Richter scale and centered in Rockaway, N.Y., it was classified as "moderate" in intensity. As people in the Northwest found out this week, the earth can suddenly come alive, even in places where such events are relatively rare -- even in the New York metropolitan area. Back in 1884, "a rumbling sound accompanied the sinking of the earth," reported the Long Island Democrat of Jamaica. It hit strongest along the New Jersey and Long Island coasts and cracked masonry from Connecticut to Pennsylvania. "Those in bathing at Rockaway Beach ran from the surf crying, 'The world has come to an end,' " the paper said. But no serious injury or damage was reported. Although temblors that size occur about 800 times per year worldwide, they strike here only once every couple of hundred years, seismologists say. A magnitude-5 or greater quake likely won't recur here for another century, they said. But if and when it does strike, it could wreak havoc because so many millions of people and thousands of buildings are now crammed together. "Even though these things don't occur that frequently, when they do, we call them low probability, high-impact events -- or extreme events," said Arthur Lerner-Lam, a seismologist and senior research scientist at the Lamont-Doherty Earth Observatory of Columbia University in Palisades, N.Y.
"There has been so much development since the last magnitude-5 quake in 1884, that even though the probability of another is low, if you measure risk . . . the potential impacts are enormous," said Lerner-Lam, of Tenafly. Few people know, but New Jersey and New York sit on a highly active earthquake zone. The area, in fact, ranks fourth nationally behind Los Angeles, San Francisco, and Seattle in quake activity, though the degree of severity is much lower here, Lerner-Lam said. "There's usually a fair amount of activity in the tri-state area," but most of it is barely detectable, he said. There are several magnitude-2 to 2.9 earthquakes -- classified as "very minor" -- in the area every month. One "minor" magnitude-3 to 3.9 quake occurs about once a year, and a "light" 4 to 4.9 quake happens once every four to 10 years, Lerner-Lam said. 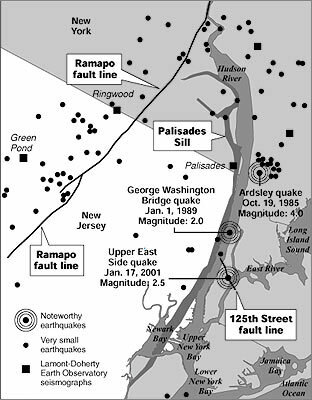 The keys to all this local rumbling are the Ramapo fault in North Jersey and the so-called 125th Street fault across Manhattan. The Ramapo fault runs 70 miles northeast from Morris County, through Ramsey and Suffern and the Hudson Highlands, to Bear Mountain, N.Y. It follows the Ramapo River through the Ramapo Mountains and is actually a "braid of faults," or a system of cracks, Lerner-Lam said. Along this line -- to the point where Routes 17 and 287 now converge -- fierce quakes exploded daily and the Earth's crust split open to welcome the Atlantic Ocean 200 million years ago. In New York, the 125th Street fault begins just south of the George Washington Bridge on the Hudson and heads through Harlem, then south across Central Park and the upper East Side, across the East River, and under Queens. To keep track of all the seismic activity, Lamont-Doherty operates three quake-monitoring stations in Ringwood and in Basking Ridge and Green Pond in Morris County. Each station has a seismometer, an instrument that pinpoints a quake by measuring the movement in the earth and combining it with the exact time, which it receives from a satellite. Observatory computers send the data to the U.S. Geological Survey's National Earthquake Information Center at Golden, Colo., near Denver, which posts the information on the agency's Web site, www.neic.cr.usgs.gov. There is no record of a locally "strong" quake, such as the magnitude-6.8 one that rattled Seattle on Wednesday, injuring more than 320 people and causing an estimated $2 billion in damage. There also have been no "major" quakes, such as the 7.6 and 7.7 shocks in El Salvador and India, respectively, that killed thousands of people in January. New Jersey has possibly been spared because it sits in the middle of the North American tectonic plate -- one of 15 massive sections of the earth's crust. The strongest quakes usually occur at plate boundaries -- such as the San Andreas fault in Southern California -- when massive amounts of subterranean stress and stored energy press the plates together. Another active area of the country is in Missouri, where four great earthquakes struck in 1811 and 1812, leveling the town of New Madrid and changing the course of the Mississippi River. What could happen here? Several projects are under way to gauge how well prepared New Jersey is to withstand the next relatively "big one." Scott Stanford, a glacial geologist with the New Jersey Department of Environmental Protection, spent the past two years sending his own shock waves through different soil types in Bergen and Hudson counties and in Newark. Wearing ear plugs and steel-tipped shoes, Stanford banged a steel plate with a 10-pound sledgehammer at selected sites to see how conductive the ground was to earthquakes. As suspicious residents looked on, Stanford whacked the plate, then recorded the time it took the waves to travel 100 feet to an instrument called a geophone. He added the results to data from test borings that engineers had made at thousands of construction sites over the years. He then ran all the numbers through a computer program to project losses from quakes. He found that if a magnitude-7 quake hit Bergen County, it might kill 223 people and hospitalize 2,200 others. Such a quake might also damage 180,500 buildings -- including 14,100 that would be destroyed. It would cause billions of dollars in damage. "That's the wonder of computers. It's totally fictional," Stanford said of the program, called HAZUS, which was designed for the West Coast, where the earth's crust is more fragmented and can tend to overestimate damage. Stanford's data also did not include structural improvements made to buildings. "I don't know how they figure the casualties. It would depend on the time of day, on whether people are on the roads," said Stanford, whose project is sponsored the New Jersey State Police and the Federal Emergency Management Agency. The shakiest ground in Bergen County, Stanford found, was in the Meadowlands, which include a lot of glacial lake sand deposits. Similar sand was found along the Hudson County waterfront, he said. Ground-shaking diminishes farther north as the ground contains more gravel, he said. "It's not so much the shaking, as the type of soil and the type of construction" that determines damage to buildings," said Stanford, who will soon begin calculating damage estimates for Essex County. Not that sports fans at Giants Stadium should necessarily worry more about quakes. "When you talk about individual structures, it's a question of how they were engineered," Stanford said. "The way they prepared each site in the Meadowlands might be somewhat different." Not just buildings but whole nations must prepare to meet and rebound from natural disasters, Lerner-Lam said. "What you'd like to do is build resilient societies, like the United States, where we worry about issues of insurance and building codes," said Lerner-Lam, head of the Advanced National Seismic System-Northeast Region, part of a national effort to update earthquake monitoring. "But are we really safe? Are we giving enough attention to low probability, high-impact events? Do we have the political and economic mechanism in place to deal with these complex risks?" he asked. And what about investing in earthquake insurance? Lerner-Lam, the seismologist, does not carry such insurance on his Tenafly home. "I'm in a well-constructed house," he said. "I live on bedrock."